Resume Assistant helps get your creative juices flowing by showing you examples of how real people — in the fields you're interested in — describe their work experience and skills. 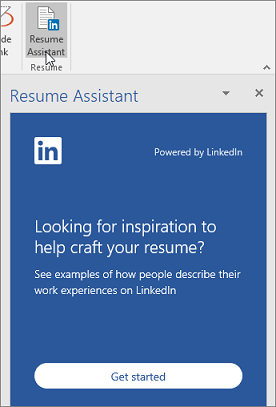 Go to Review > Resume Assistant (The first time you do this, click Get started in the pane). Type the role you're interested in, such as project manager, and optionally, an industry, such as computer software. Click See examples, and Resume Assistant shows you work experience descriptions to use as inspiration for writing your own description. Resume Assistant surfaces open job opportunities that might interest you. Use the short descriptions for ideas on how to tailor your resume even further. When you finish editing your resume, click on these jobs to learn more or apply for the job. You don't need a LinkedIn account to use Resume Assistant, although you can sign in to LinkedIn (or sign up for an account) when you follow a link from Word to the LinkedIn site. Note: When you start a new document based on a resume template, Resume Assistant opens automatically. 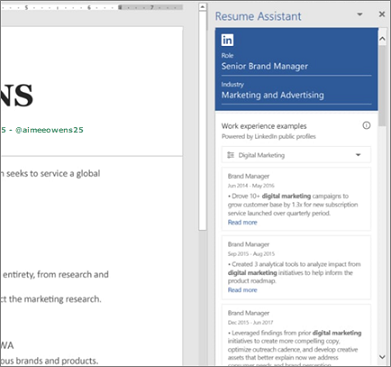 Resume Assistant is available in Word for Office 365 on Macs and Windows computers, and in Word Online. Only a few locale and language settings are supported. Note: Resume Assistant is available only when you're editing a document, so the ribbon button will appear dimmed when you've opened a document you don't have permission to edit, and any time you open a document as read-only. If the Resume Assistant button appears dimmed and you're editing the document, then LinkedIn integration may have been switched off. On a Windows computer, check File > Options > General > Show LinkedIn features in my Office applications. For more information about this setting, see About LinkedIn information and features in Microsoft apps and services. On a Mac, uncheck Word > Preferences > General > Turn off Resume Assistant. Additionally, your organization's Office 365 administrator might have made Resume Assistant unavailable to you (see Enabling LinkedIn integration in Azure Active Directory for more information). Resume Assistant is an English-language feature. To use it, the display language in Word must be set to English. In Windows, you can turn off Resume Assistant by switching off all LinkedIn features in Office: in File > Options > General, uncheck Show LinkedIn features in my Office applications. For more information about this setting, see About LinkedIn information and features in Microsoft apps and services. On a Mac, if you want to turn off Resume Assistant, go to Word > Preferences > General, and check Turn off Resume Assistant. How does my resume get detected? 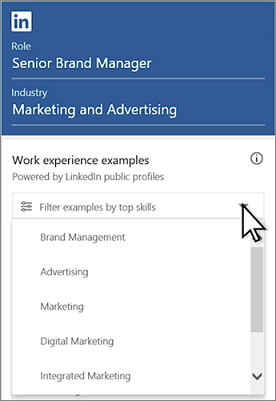 The work experience examples in Resume Assistant are drawn from public profiles on LinkedIn, and they're based on the roles and industries you choose, so you get ideas on how to tailor your descriptions. Remember, the descriptions are examples only. Your resume reflects you, not someone else. Because Resume Assistant is showing you public profiles, you only see the experience and skill descriptions, not who they belong to. If you have a LinkedIn account, the information you share in your public profile is available to be shown in Resume Assistant, but you can go to your privacy settings to opt out. For more information about public profiles on LinkedIn, see LinkedIn Public Profile Visibility.